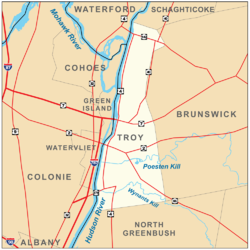 Troy is a city in the U.S. state of New York and the seat of Rensselaer County. 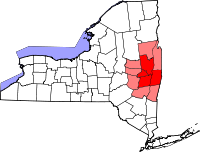 The city is located on the western edge of Rensselaer County and on the eastern bank of the Hudson River. Troy has close ties to the nearby cities of Albany and Schenectady, forming a region popularly called the Capital District. The city is one of the three major centers for the Albany Metropolitan Statistical Area (MSA), which has a population of 1,170,483. At the 2010 census, the population of Troy was 50,129. Troy's motto is Ilium fuit. Troja est, which means "Ilium was, Troy is". Today, Troy is home to Rensselaer Polytechnic Institute, the oldest private engineering and technical university in the US, founded in 1824. Due to the confluence of major waterways and a geography that supported water power, the American industrial revolution took hold in this area making Troy reputedly the fourth wealthiest city in America around the turn of the 20th century. Troy, therefore, is noted for a wealth of Victorian architecture downtown and elaborate private homes in various neighborhoods. Several churches boast a concentrated collection of stained glass windows by Louis Comfort Tiffany. Troy is also home to the world renowned "Troy Music Hall", officially, the "Troy Savings Bank Music Hall" dating from the 1870s, which is said to have superb acoustics in a combination of restored and well preserved performance space. The area had long been occupied by the Mahican Indian tribe, but Dutch settlement began in the mid 17th century. The patroon Kiliaen van Rensselaer called the region Pafraets Dael, after his mother. The Dutch colony was conquered by the English in 1664, and in 1707 Derick Van der Heyden purchased a farm near today's downtown area. In 1771, Abraham Lansing had his farm in today's Lansingburgh laid out into lots. Sixteen years later, Van der Heyden's grandson Jacob had his extensive holdings surveyed and laid out into lots, naming the new village Vanderheyden. In 1789, Troy adopted its present name following a vote of the people. Troy was incorporated as a town two years later and extended east across the county to the Vermont line, including Petersburgh. In 1796, Troy became a village and in 1816, it became a city. Lansingburgh, to the north, became part of Troy in 1900. Prior to the arrival of Europeans, the Mohican Indians had a number of settlements along the Hudson River near the confluence with the Mohawk River. The land comprising the Poesten Kill and Wynants Kill areas were owned by two Mohican groups. The land around the Poesten Kill was owned by Skiwias and was called Panhooseck. The area around the Wynants Kill, was known as Paanpack, was owned by Peyhaunet. The land between the creeks, which makes up most of downtown and South Troy, was owned by Annape. South of the Wynants Kill and into present-day North Greenbush, the land was owned by Pachquolapiet. These parcels of land were sold to the Dutch between 1630 and 1657 and each purchase was overseen and signed by Skiwias, the sachem at the time. In total, more than 75 individual Mohicans were involved in deed signings in the 17th century. The site of the city was a part of Rensselaerswyck, a patroonship created by Kiliaen van Rensselaer. Dirck Van der Heyden was one of the first settlers. In 1707, he purchased a farm of 65 acres (26 ha), which in 1787 was laid out as a village. An early local legend that a Dutch girl had been kidnapped by an Indian male who did not want her to marry someone else gained some credence when two skeletons were found in a cave under Poestenkill Falls in the 1950s. One skeleton was female and Caucasian with an iron ring. The other was Native-American and male. The name Troy (after the legendary city of Troy, made famous in Homer's Iliad) was adopted in 1789 before which it had been known as Ashley's Ferry, and the region was formed into the Town of Troy in 1791 from part of the Manor of Rensselaerswyck. The township included Brunswick and Grafton. Troy became a village in 1801 and was chartered as a city in 1816. In 1900, the city of Lansingburgh was merged into Troy. In the post-Revolutionary War years, as central New York was first settled, there was a strong trend to classical names, and Troy's naming fits the same pattern as the New York cities of Syracuse, Rome, Utica, Ithaca, or the towns of Sempronius, Manlius, or dozens of other classically named towns to the west of Troy. Northern and Western New York was a theater of the War of 1812, and militia and regular army forces were led by Stephen Van Rensselaer of Troy. Quartermaster supplies were shipped through Troy. A local butcher and meat-packer named Samuel Wilson supplied the military, and, according to an unprovable legend, barrels stamped "U.S." were jokingly taken by the troops to stand for "Uncle Sam" meaning Wilson. Troy has since claimed to be the historical home of Uncle Sam. Through much of the 19th and into the early 20th century, Troy was not only one of the most prosperous cities in New York State, but one of the most prosperous cities in the entire country. Prior to its rise as an industrial center, Troy was the transshipment point for meat and vegetables from Vermont, which were sent by the Hudson River to New York City. The Federal Dam at Troy is the head of the tides in the Hudson River and Hudson River sloops and steamboats plied the river on a regular basis. This trade was vastly increased after the construction of the Erie Canal, with its eastern terminus directly across the Hudson from Troy at Cohoes in 1825. Troy's one-time great wealth was produced in the steel industry, with the first American Bessemer converter erected on the Wyantskill, a stream with a falls in a small valley at the south end of the city. The industry first used charcoal and iron ore from the Adirondacks. Later on, ore and coal from the Midwest was shipped on the Erie Canal to Troy, and there processed before being sent on down the Hudson to New York City. The iron and steel was also used by the extensive federal arsenal across the Hudson at Watervliet, New York, then called West Troy. After the American Civil War, the steel production industry moved west to be closer to raw materials. The presence of iron and steel also made it possible for Troy to be an early site in the development of iron storefronts and steel structural supports in architecture, and there are some significant early examples still in the city. The initial emphasis on heavier industry later spawned a wide variety of highly engineered mechanical and scientific equipment. Troy was the home of W. & L. E. Gurley, Co., makers of precision instruments. Gurley's theodolites were used to survey much of the American West after the Civil War and were highly regarded until laser and digital technology eclipsed the telescope and compass technology in the 1970s. Bells manufactured by Troy's Meneely Bell Company ring all over the world. And Troy was also home to a manufacturer of racing shells that used impregnated paper in a process that presaged the later use of fiberglass, Kevlar and carbon fiber composites. This scientific and technical proficiency was supported by the presence of Rensselaer Polytechnic Institute, or RPI, one of the highest-ranked engineering schools in the country. RPI was originally sponsored by Stephen Van Rensselaer, one of the most prominent members of that family. RPI was founded in 1824, and eventually absorbed the campus of the short-lived, liberal arts-based Troy University, which closed in 1862 during the Civil War. Rensselaer founded RPI for the "application of science to the common purposes of life", and it is the oldest technological university in the English-speaking world. The institute is known for its success in the transfer of technology from the laboratory to the marketplace. On December 23, 1823, The Troy Sentinel was the first publisher of the world-famous Christmas poem "A Visit from St. Nicholas" (also known as "The Night Before Christmas" or "Twas the Night Before Christmas"). The poem was published anonymously. Its author has long been believed to have been Clement Clarke Moore, but its author is now regarded by a few to have been Henry Livingston, Jr. Troy was an early home of professional baseball, and was the host of two major league teams. The first team to call Troy home was the Troy Haymakers, a National Association team in 1871 and 1872. One of their major players was Williams H. "Bill" Craver, a noted catcher and Civil War veteran, who also managed the team. Their last manager was Jimmy Wood, reckoned the first Canadian in professional baseball. The Troy Haymakers folded, and Troy had no team for seven seasons. Then, for four seasons, 1879 to 1882, Troy was home to the National League Troy Trojans. The Trojans were not competitive in the league, but they did have the biggest hitter in professional baseball, Dan Brouthers. Troy has been nearly destroyed by fire three times. The Great Troy fire of 1862 burnt the W. & L. E. Gurley, Co. factory, which was later that year replaced by the new W. & L. E. Gurley Building, now a National Historic Landmark: Gurley & Sons remains a worldwide leader in precision instrumentation. In 1892, Robert Ross, a poll watcher, was shot dead (and his brother wounded) by operatives of Mayor Edward Murphy, later a U.S. Senator, after uncovering a man committing voter fraud. The convicted murderer, Bartholomew "Bat" Shea, was executed in 1896, although another man, John McGough, later boasted that he had actually been the shooter. In 1900 Troy annexed Lansingburgh, a former town and village whose standing dates back prior to the War of Independence, in Rensselaer County. Lansingburgh is thus often referred to as "North Troy". However, prior to the annexation, that portion of Troy north of Division Street was called North Troy and the neighborhood south of Washington Park is referred to as South Troy. To avoid confusion with streets in Troy following the annexation, Lansingburgh's numbered streets were renamed: its 1st Street, 2nd Street, 3rd Street, etc., became North Troy's 101st Street, 102nd Street, 103rd Street, etc. Lansingburgh was home to the Lansingburgh Academy. In addition to the strong presence of the early American steel industry, Troy was also a manufacturing center for shirts, shirtwaists, collars and cuffs. In 1825, a local resident Hannah Lord Montague, was tired of cleaning her blacksmith husband's shirts. She cut off the collars of her husband's shirts, since only the collar was soiled, bound the edges and attached strings to hold them in place. (This also allowed the collars and cuffs to be starched separately.) Montague's idea caught on, and changed the fashion for American men's dress for a century. Her patented collars and cuffs were first manufactured by Maullin & Blanchard, which eventually was absorbed by Cluett, Peabody & Company. Cluett's "Arrow shirts" are still worn by men across the country. The large labor force required by the shirt manufacturing industry also produced in 1864 the nation's first female labor union, the Collar Laundry Union, founded in Troy by Kate Mullany. On February 23, 1864, 300 members of the union went on strike. After six days, the laundry owners gave in to their demands and raised wages 25%. There were further developments in the industry, when, in 1933, Sanford Cluett invented a process he called Sanforization, a process that shrinks cotton fabrics thoroughly and permanently. Cluett, Peabody's last main plant in Troy was closed in the 1980s, but the industrial output of the plant had long been transferred to facilities in the South. When the iron and steel industry moved west to Pennsylvania and beyond, and with a similar downturn in the collar industry, Troy's prosperity began to fade. After the passage of Prohibition, and given the strict control of Albany by the O'Connell political machine, Troy became a way station for an illegal alcohol trade from Canada to New York City. Likewise, the stricter control of morality laws in the neighboring New England states encouraged the development of openly operating speakeasies and brothels in Troy. Gangsters such as "Legs Diamond" conducted their business in Troy, giving the city a somewhat colorful reputation through World War II. 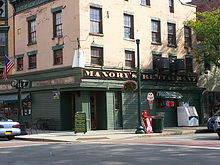 A few of the buildings from that era have since been converted to fine restaurants, such as the former Old Daly Inn. Like many old industrial cities, Troy has had to deal with not only the loss of its manufacturing base, but a loss of population and wealth to suburbs and other parts of the country. This led to dilapidation and disinvestment, until later efforts were made to preserve Troy's architectural and cultural past. Kurt Vonnegut lived in Troy and the area, and many of his novels include mentions of "Ilium" (an alternate name for Troy) or surrounding locations. Vonnegut wrote Player Piano in 1952, based on his experiences working as a public relations writer at nearby General Electric. His 1963 novel, Cat's Cradle, was written in the city and is set in Ilium. His recurring main character, Kilgore Trout, is a resident of Cohoes, just across the Hudson River from Troy. As of 2014[update], Troy is updating its citywide comprehensive plan for the first time in more than 50 years. The two-year process is known as "Realize Troy" and was initiated by the Troy Redevelopment Foundation (with members from the Emma Willard School, Rensselaer Polytechnic Institute, Russell Sage College and St. Peter's Health Partners). Urban Strategies Inc. (Toronto) is planning Troy's redevelopment. According to the United States Census Bureau, the city has a total area of 11.0 square miles (28 km2), of which 10.4 square miles (27 km2) is land and 0.6 square miles (1.6 km2) (5.44%) is water. Troy is located several miles north of Albany near the junction of the Erie and Champlain canals, via the Hudson River and is the terminus of the New York Barge Canal. It is the distributing center for a large area. The western edge of the city is flat along the river, and then steeply slopes to higher terrain to the east. The average elevation is 50 feet, with the highest elevation being 500 feet in the eastern part of the city. The city is longer than it is wide, with the southern part wider than the northern section of the city (the formerly separate city of Lansingburgh). Several kills (Dutch for creek) pass through Troy and empty into the Hudson. The Poesten Kill and Wynants Kill are the two largest and both have several small lakes and waterfalls along their routes in the city. There are several lakes and reservoirs within the city including Ida Lake, Burden Pond, Lansingburgh Reservoir, Bradley Lake, Smarts Pond and Wright Lake. At the 2010 census, there were 50,129 people, 20,121 households and 10,947 families residing in the city. The population density was 4,840.1 per square mile. There were 23,474 housing units. The racial makeup of the city was 69.7% non-Hispanic White, 16.4% African American, 0.3% Native American, 3.4% Asian, 0% Pacific Islander, and 4.1% from two or more races. Hispanic or Latino of any race were 7.9% of the population. The median household income in 2013 was $37,805 (NYS average of $57,369), and the median family income was $47,827 (NYS average of $70,485). The median per capita income for the city was $20,872 (NYS average of $32,514). About 27.3% of the population were living in poverty as of 2013. Troy is known as the "Collar City" due to its history in shirt, collar, and other textile production. At one point Troy was also the second largest producer of iron in the country, surpassed only by the city of Pittsburgh, Pennsylvania. Troy, like many older industrial cities, has been battered by industrial decline and the migration of jobs to the suburbs. Nevertheless, the presence of Rensselaer Polytechnic Institute is helping Troy develop a small high-technology sector, particularly in video game development. The downtown core also has a smattering of advertising and architecture firms, and other creative businesses attracted by the area's distinctive architecture. RPI is the city's largest private employer. The Rensselaer School, which later became Rensselaer Polytechnic Institute (RPI), was founded in 1824 with funding from Stephen Van Rensselaer, a descendant of the founding patroon, Kiliaen. In 1821, Emma Willard founded the Troy Female Seminary. It was renamed Emma Willard School (America's first girl's high school and a high-academic boarding and day school) in 1895. The former Female Seminary was later reopened (1916) as Russell Sage College (a comprehensive college for women). All of these institutions still exist today. In addition, Troy is also home to the 10,000-student Hudson Valley Community College (part of the State University of New York system), Troy High School, three private high schools: La Salle Institute (Catholic military-style), Emma Willard School, Catholic Central High School (a regional Catholic high school in Lansingburg section), and one charter middle and high school, Troy Prep. Northeast Health is now the umbrella administration of Troy two large hospitals (Samaritan Hospital and St. Mary's Hospital). The city is home to many non-profits. Unity House serves as a food pantry, and assists domestic violence safety, and housing support.Joseph's house helps with sheltering the homeless. The city is also home to numerous churches (Orthodox, Catholic, and Protestant), three synagogues, and one mosque. Troy is home to Victorian and Belle Époque architecture. The city's architectural achievements rate inspirational and serve its citizens, visitors and onlookers as well as posterity, with as a veritable treasure chest set in masonry exteriors, as evidenced by the sheer variety of its building's design vernacular, which includes specimens redolent of numerous ancient civilizations' and later European edifice models. Notably, the city's First and Second Industrial Revolutions' decades-long innovations and successes enabled commercial and residential builders the financial means and engineering knowledgebase to express themselves in highly individualized, and most often, grand masonry buildings. That opportunity to build such wondrous structures is owed, in part, too, to the fact that two major fires had devastated much of Troy's earlier wooden structures, availing large tracts for re-development. The Hudson and Mohawk rivers play their part, as does the Erie Canal and its lesser tributary canal systems, and later the railroads that linked Troy to the rest of the Empire State, New York City to the south, and Utica, New York, Syracuse, New York, Rochester, New York, Buffalo, New York and the myriad of emergent Great Lakes' cities in the burgeoning United States. Wood: fine wood work in found in many of Troy's buildings. Tiffany and La Farge created magnificent stained-glass windows, transoms and other decorative stained-glass treatments for their customers in Troy. With many examples of intact 19th-century architecture, particularly in its Central Troy Historic District, this has helped to lure several major movies to film in Troy, including Ironweed, The Age of Innocence (Filmed partially in the Paine mansion), Scent of a Woman, The Bostonians, The Emperor's Club, and The Time Machine. There are many buildings in a state of disrepair, but community groups and investors are restoring many of them. Troy's downtown historic landmarks include Frear's Troy Cash Bazaar, constructed on a steel infrastructure clad in ornately carved white marble; the Corinthian Courthouse that is constructed of gray granite; the Troy Public Library, built in an elaborate Venetian palazzo style with high-relief carved white marble; the Troy Savings Bank Music Hall, designed in the Second Empire style, with a recital hall with highly regarded acoustic properties. There is a rich collection of Colonial, Federal, Italianate, Second Empire, Greek Revival, Egyptian Revival, Gothic Revival and other Romantic period townhouses surrounding the immediate downtown. The Hart-Cluett Mansion displays a Federal facade executed in white marble, quarried in Tuckahoe, New York. Often with foundations of rusticated granite block. Medina sandstone, a deep mud-red color, from Medina, New York, was also used. As with many American cities, several city blocks in downtown Troy were razed during the 1970s as a part of an attempted urban renewal plan, which was never successfully executed, leaving still vacant areas in the vicinity of Federal Street. Today, however, there have since been much more successful efforts to save the remaining historic downtown structures. Part of this effort has been the arrival of the "Antique District" on River Street downtown. Cafes and art galleries are calling the area home. As home to many art, literature, and music lovers, the city hosts many free shows during the summer, on River Street, in parks, and in cafes and coffee shops. The Troy Farmer's Market is a popular event since 2000 that occurs every Saturday on River Street during the summer, or in the Atrium of downtown Troy during the winter. The market offers over 70 local vendors offering a variety of goods. Troy Flag Day Parade – The Troy Flag Day Parade was the largest one to honor the American flag in the U.S., taking place in early June. It started in 1967 and ended in 2017, after 51 years. Troy River Fest – Annual, family-oriented arts/crafts and music festival held in June. Showcasing carefully curated, locally crafted hand-made goods and local cuisine in an open-air bazaar situated in the scenic, historic downtown district. Troy Turkey Trot – Annual Thanksgiving Day Run; the oldest race in the Capital District. Troy Night Out – Last Friday of every month. Arts and cultural event that regularly draws thousands people onto the streets of Downtown Troy. Attendees enjoy countless art events, music venues, fine restaurants and unique boutiques of all varieties. Rockin' on the River – Every Wednesday evening from June 18 through August 27, the Downtown Troy Business Improvement District and the City of Troy present this free, outdoor concert series"
Troy Pig Out – One of the most loved summertime events in the Capital Region, the Troy Pig Out is a full day of fun where culinary competitors duke it out for best BBQ, and people flock to Riverfront park to taste some of the area's best food. Chowderfest – Chowder tasting throughout downtown Troy. Numerous local retailers participate in the day's activities with a citywide sidewalk sale. It's a full day of fall food, live music, and family fun! In 2009, Troy ranked #15 on Newsmax magazine's list of the "Top 25 Most Uniquely American Cities and Towns", a piece written by current CBS News travel editor Peter Greenberg. In determining his ranking, Greenberg cited Troy's Flag Day Parade and called the city a "great example of American spirit". The executive branch consists of a mayor who serves as the chief executive officer of the city. The mayor is responsible for the proper administration of all city affairs placed in his/her charge as empowered by the city charter. The mayor enforces the laws of New York State as well as all local laws and ordinances passed by the city council. She or he exercises control over all executive departments of the city government, including the Departments of Finance, Law, Public Safety, Public Works, Public Utilities, and Parks and Recreation. The mayor's term of office is four years, and an incumbent is prohibited from serving for more than two consecutive terms (eight years). The current mayor of Troy is Patrick Madden (D), who is serving his first term, having been elected on November 3, 2015. Troy's legislative branch consists of a city council composed of seven elected members: one at-large member who represents the entire city and acts as City Council President, and six district members who represent each of the six districts of Troy. Currently, there are 4 Democrats and 3 Republicans. Each council member serves a two-year term and an incumbent is prohibited from serving for more than four consecutive terms (eight years). The council meets on the first Thursday of every month at 7:00 pm in the City Hall council chambers. All meetings are open to the public and include a public forum period held before official business where residents can address the council on all matters directly pertaining to city government. The City of Troy is divided into thirty (30) election districts, also known as EDs. An ED is the finest granularity political district that can be used, from which all other political districts are formed. Other political districts that make use of these EDs include City Council Districts, County Legislative Districts, State Assembly Districts, State Senate Districts, and U.S. Congressional Districts. Bonanza Bus Lines and Peter Pan Bus Lines run to locations on 15th Street and River Street. U.S. Route 4 runs north-south through the city. New York Route 7 passes through, east-west through the city, with a bridge west across the Hudson River, as does New York Route 2. 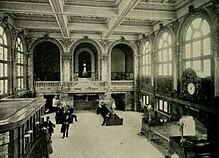 The New York Central Railroad, Delaware and Hudson Railroad, Rutland Railroad and Boston and Maine Railroad provided passenger rail service to Troy. By the late 1950s, only the Boston & Maine passenger service remained. The last Boston and Maine passenger train arrived from Boston, Massachusetts in 1958. Troy Union Station closed and was demolished later that year. Amtrak serves Albany-Rensselaer station, 8.5 miles to the south of Troy. Hadden Clark, Cannibal child murderer and suspected serial killer; Born in Troy. Tim Hauser (1941–2014) singer and founding member of the vocal group The Manhattan Transfer. Troy Fire Department's 119 uniformed personnel operate out of 6 fire stations located throughout the city and operates 5 Engine companies, a Rescue-Engine company, 2 Truck companies, 3 Ambulances, a Hazardous Material response unit (Troy Fire Department is the hazardous material response unit for Rensselaer County) and 2 rescue boats. ^ "2016 U.S. Gazetteer Files". United States Census Bureau. Retrieved Jul 5, 2017. ^ Ilium fuit is the well-known expression from the Aeneid, where it is the beginning of Parthus' reply to Aeneas. Aeneid, Bk. II., 325. 30 153, and which had come to mean a complete and final end. The second half, Troja est, is a defiant declaratory statement that nevertheless, Troy still lives. ^ "Troy History". www.triposo.com. Retrieved 2018-07-05. ^ "A Resourceful People A Pictorical History of Rensselaer County, New York"
^ "America's Best Colleges 2007". U.S. News. 2006. Retrieved 2007-12-01. ^ "RPI History Main Page". Retrieved 2007-01-21. ^ "Rensselaer in Brief". 2008. Retrieved 2008-05-22. ^ a b Kenneth C. Crowe II (June 20, 2014). "Troy plans for first citywide plan in 52 years". Times Union. Albany. ^ Jim Franco (June 19, 2014). "A company to do a comprehensive plan (NEWS)". T-Spin. ^ Robert Breuer, Troy's RiverSpark Visitor Center Archived 2004-12-05 at the Wayback Machine. Retrieved 1 August 2007. ^ a b "Troy (city), New York Quick Facts". U.S. Census Bureau. Archived from the original on September 15, 2013. Retrieved September 4, 2013. ^ "Troy (city), New York City data". Retrieved February 26, 2016. ^ "Unity House of Troy | Making Life Better – Human Service Agency – Domestic Violence, Street Ministry, Housing and Support Services, Unity Sunshine". www.unityhouseny.org. Retrieved 2019-01-23. ^ "Joseph's House Troy, NY - shelter and support services for the homeless". www.josephshousetroy.org. Retrieved 2019-01-23. ^ "Historic Homes of Troy's 2nd Street – Adirondack Girl @ Heart". Adirondack Girl @ Heart. 2014-11-25. Retrieved 2017-02-12. ^ "Troy River Fest – Downtown Troy BID". Downtown Troy BID. ^ "Bakerloo Theatre Project". Bakerloo Theatre Project. ^ "Troy Victorian Stroll". Troy Victorian Stroll. ^ "Troy Turkey Troy". Troy Turkey Trot. ^ "The Enchanted City". The Enchanted City Troy, NY. Retrieved 2017-11-28. ^ "Troy Night Out". Downtown Troy BID. ^ "Rockin on the River". Downtown Troy BID. ^ "Troy Pig Out". Downtown Troy BID. ^ "Troy Chowderfest". Downtown Troy BID. ^ Greenberg, Peter. "Newsmax Magazine Rates the Top 25 Most Uniquely American Cities And Towns". Retrieved 15 January 2014. ^ "Troy | www.cdta.org". www.cdta.org. Retrieved 2019-01-23. ^ "Troy Union Railroad". PenneyVanderbilt. Retrieved 24 January 2019. ^ a b c d e f g h i j k l m n o p q r s t u v w x y z aa ab ac ad ae af ag ah ai aj ak al am an ao ap aq National Park Service (2010-07-09). "National Register Information System". National Register of Historic Places. National Park Service. ^ "National Register of Historic Places Listings". Weekly List of Actions Taken on Properties: 12/31/12 through 1/04/12. National Park Service. 2013-01-11. ^ "50 years of innovation and excellence". Hudson Valley Community College. Archived from the original on 2007-10-24. Retrieved 2009-12-21. ^ "National Register of Historic Places Listings". Weekly List of Actions Taken on Properties: 11/19/12 through 11/23/12. National Park Service. 2012-11-30. ^ "National Register of Historic Places listings for July 15, 2011". National Park Service. July 15, 2011. Retrieved July 15, 2011. ^ "National Register of Historic Places Listings". Weekly List of Actions Taken on Properties: 1/13/14 through 1/17/14. National Park Service. 2014-01-24. ^ "National Register of Historic Places Listings". Weekly List of Actions Taken on Properties: 12/09/13 through 12/13/13. National Park Service. 2013-12-20. ^ "Troy Gas Light Company, Gasholder House" (PDF). Society for Industrial Archeology. Retrieved 2010-01-23. ^ a b "National Register of Historic Places Listings". Weekly List of Actions Taken on Properties: 2/10/14 through 2/14/14. National Park Service. 2014-02-21. ^ "National Register of Historic Places Listings". Weekly List of Actions Taken on Properties: 3/04/13 through 3/08/13. National Park Service. 2013-03-15. ^ "Joe Alaskey, R.I.P." News From ME. 3 February 2016. ^ "Greg Schutz". Fiction Writers Review. Retrieved 20 December 2012. ^ "Companion Map to Alice Fulton's The Nightingales of Troy". Google Maps. Retrieved 20 December 2012. ^ Skinner, Charles. "Bell Casting in Troy". Meneeley Bell online Museum. Archived from the original on 30 June 2014. Retrieved 12 July 2013. ^ 1910 US Census: Edward B. Hughes (head) aged 30, Susan B. Hughes (wife) aged 30. Address: 693 Third Avenue, Troy. ^ "William Marcy". Biographical Directory of the United States Congress. Retrieved 20 October 2012. ^ "John Morrissey". Biographical Directory of the United States Congress. Retrieved 20 October 2012. ^ The Blue Book of the State of Wisconsin (18th ed.). Madison, Wis.: David Atwood. 1879. p. 495. ^ "Edward Murphy". Biographical Directory of the United States Congress. Retrieved 20 October 2012. ^ "WARREN, Joseph Mabbett, (1813–1896)". Biographical Directory of the United States Congress. Retrieved October 10, 2012. Hayner, Rutherford (1925). 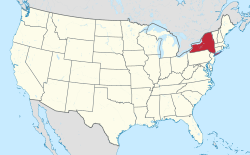 Troy and Rensselaer County New York: A History. New York: Lewis Historical Publishing Company, Inc. OCLC 22524006. Sylvester, Nathaniel Bartlett (1880). History of Rensselaer Co., New York with Illustrations and Biographical Sketches of its Prominent Men and Pioneers. Philadelphia: Everts & Peck. OCLC 3496287. Rittner, Don (2002). Troy, NY: A Collar City History. Arcadia Publishing. ISBN 0-7385-2368-2. Weise, Arthur James (1876). History of the city of Troy: from the Expulsion of the Mohegan Indians to the Present Centennial Year of Independence of the United States of America, 1876. Troy, New York: William H. Young. OCLC 12930415. Esposito, Michael A. (2009). Troy's Little Italy. Arcadia Publishing. ISBN 978-0-7385-6513-2. Wikimedia Commons has media related to Troy, New York. Wikivoyage has a travel guide for Troy (New York).